Today is my first day of vacation. For two weeks, I am free from both jobs. 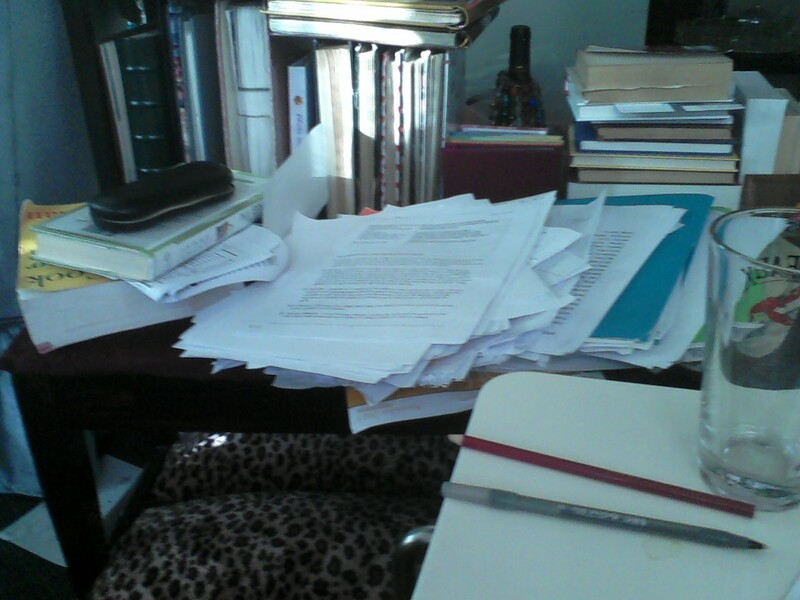 That’s what the bench in my office area looks like after grading. That’s kind of how my mind feels, too. A chaotic whirlwind of thoughts and ideas and decisions that swirl around and land in one big heap. All is not lost, though. The next two weeks, I’m putting home back together, and hopefully, my mind will follow. Of all the places in the world, I want home to be the place where I find tiny pockets of the kingdom of God. I want it to be a place of creation. I want it to be a place where people are welcomed and fed, where the wine (and the coffee) never run out. I want it to shout good news. The semester end falls at a good time. As in Advent we are preparing for Jesus, in this time off from my regular work, I am preparing as well. Preparing to be well and to spread joy and to welcome in the new year with expectation and hope. I’m synching up with others on the topic of Coming Home here. Click to read more! on December 18, 2013 at 4:16 am | Reply mobile homes (not that kind) | kathy escobar. on December 18, 2013 at 4:43 pm | Reply Is There Room For Jesus To Find a Home In Your Heart?